Nutrition is the basis for health in the body. The old saying “You are what you eat” still stands true. If you put the wrong things into your body, you will be unhealthy and feel bad. The same is true for our dogs and cats. If we feed them highly nutritious foods that are species appropriate many disease conditions will resolve without having to be treated with pills or medicines and without having to visit the veterinarian’s office frequently. The largest part of the immune system is located in the gut. There is the highest number of immune presenting cells in the GI tract extending from the mouth and continuing through the intestines. If we provide nutritious foods, the body responds in a healthy, disease-free manner. If we provide the body with low quality or inappropriate foods, the body will try to protect itself and create areas of inflammation and mucous. These areas could be in the GI tract, respiratory tract, skin or anywhere else and lead to things such as inflammatory bowel disease (think of Celiac disease in people due to gluten intolerance), asthma or itchy, red skin with infections. Dogs and cats are carnivores and should be fed accordingly. Think about the other animals that would be classified together with dogs and cats….wolves, coyotes, tigers, lions, bobcats, etc…..have you ever seen them eating corn, wheat, soybeans or many of the other things that are in most commercial pet diets? I personally have not seen the zookeepers feeding the wolves or tigers a bunch of corn or throwing out slices of bread to them….have you? Didn’t think so. They are feeding them a meat-based diet consisting of mostly animal proteins with other minerals and vitamins added as supplements. There are many arguments that domestic dogs and cats have evolved to eat a more grain based diet, but I still have a hard time believing that because every time I see feral cats around town or out on the farms they always seem to be carrying dead mice or moles….not once an ear of corn….but I’m waiting. There are some basic rules to follow when choosing a food for your pet and there are way too many variables to cover in this short space, so first of all look at the ingredients and see what they are actually putting into the food. Read the label from the first ingredient until you see a fat or oil source and these ingredients will comprise the majority of the food. There should be more animal protein sources than grain or vegetable sources…if you don’t see this, try a different food. Secondly, try to choose a food that does not have different colors, shapes or sizes. This is usually a marketing tactic to make it look more appealing to you. These companies are often trying to make up for the lack of quality ingredients in the food too. Thirdly, grocery store brands are usually of a lower quality so I try to choose foods from different sources such as a pet store or veterinarian. There are many other things that go into the choice of dog and cat foods, but these are good basic rules to follow to get started. Think of it this way…you can eat 150 calories which would equal 1 candy bar –or- 6 cups of mixed vegetables!! The calories may be the same in these, but the nutritional value is vastly different! We use a variety of different foods and types of foods including dry kibble, canned foods and raw food diets. The commercial raw food diets are the closest to what would be provided in nature and many times will resolve chronic ongoing issues with the animals such as inflammation of skin, ears and allergies. This does not, however, mean that you should go buy ground beef or chicken and start feeding only that to your pet. In fact, I don’t recommend that at all. 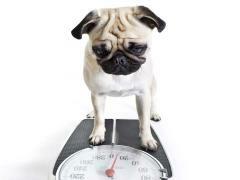 The diet can be raw foods but still needs to be balanced to provide all of the nutrition that the animal needs. It is best to consult with a veterinarian or nutritionist to make sure the diet is properly balanced to provide all of the necessary vitamins, minerals and amino acids. We can help you choose a food that is appropriate for your dog or cat. We provide nutrition consultations and can help find the right mixture of dry, canned, raw or whatever kind of diet you want to feed. If you are not sure, we can also help explain the differences and help with transition from one food to another.